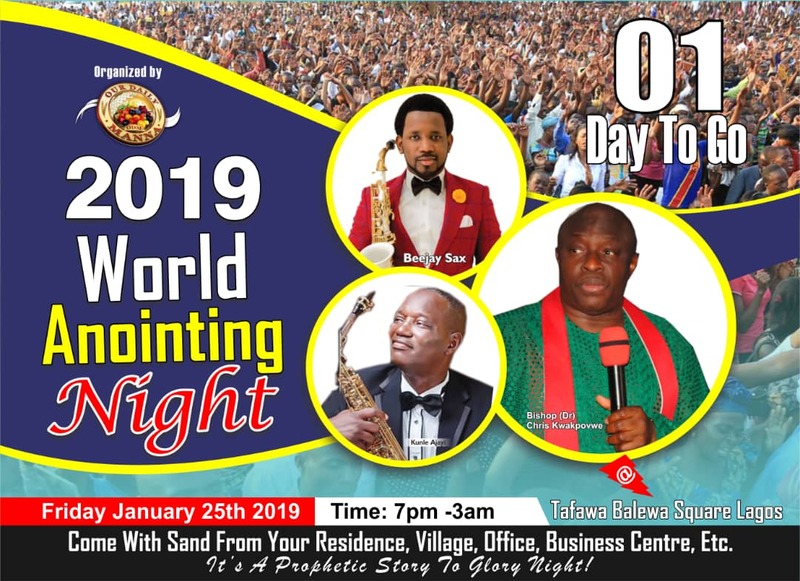 All roads lead to the main bowl of the Tafawa Balewa Square, Lagos on Friday January 25 as thousands of worshiper converge for the annual World Anointing Night programme of the Manna Prayer Mountain Ministries Int’l. 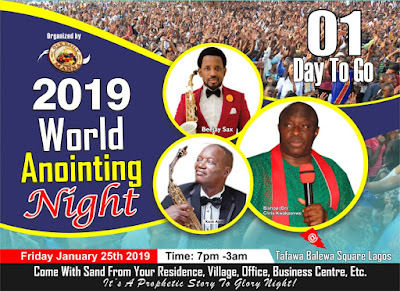 The yearly programme, which kicked off with a 21-day fasting, will climax with the special anointing service that is expected to draw different people from across the globe including the United Kingdom, United States, Canada and South Africa. With the theme for this year’s programme tagged ‘From Story To Glory’, the General Overseer of the Ministries and publisher of the popular devotional “Our Daily Manna”, Bishop (Dr) Chris Kwakpovwe, said everyone should come with high expectations as there will be deliverance, healing, miracles and instant testimonies at the special anointing service. “The power of God will move in the crowd as His Glory and presence shall fill the earth. There shall be abundance rain of blessings of God Almighty locating everyone during the anointing service and all challenges shall surely give way. There shall be total divine visitation with fire,” the Bishop assured. With the programme starting at 7p.m, participants are enjoined to come with mantles or points of contact which will be used in prophetic prayers. The ministry has also put everything in place to ensure that everyone feels comfortable as they seek the face of God while there will also be music ministrations by two great saxophonists; Pastor Kunle Ajayi and BeeJay Sax.